At the Triune Council 2052 Christmas Party, held at Toner Hall in St. Margaret’s Church in Pearl River: (L to R) Chet Nawoichyk (the Fisher Foundation), Liz O’Brien (Rockland RTL), Peg Beirne (Rockland Catholic Coalition), Ellen Traina (Birthright), Pete Noonan (COPS Barn), Dee DeFelice (Financial Secretary), Kevin McGovern (COPS Barn), Msg. John J. O’Keefe (pastor of St. Margaret’s) John Rio (Grand Knight), Joe Jacobs (Divine Providence), Nannette Morris (Good Counsel) and Bill Palino (Rockland Sister Cities Project). Photo by Frank Traina. Demonstrating what it really means to be prolife, the Triune and McCloskey Councils of the Knights of Columbus made generous Christmas donations to several local and international charities and nonprofit groups, including the Rockland Right to Life Committee. 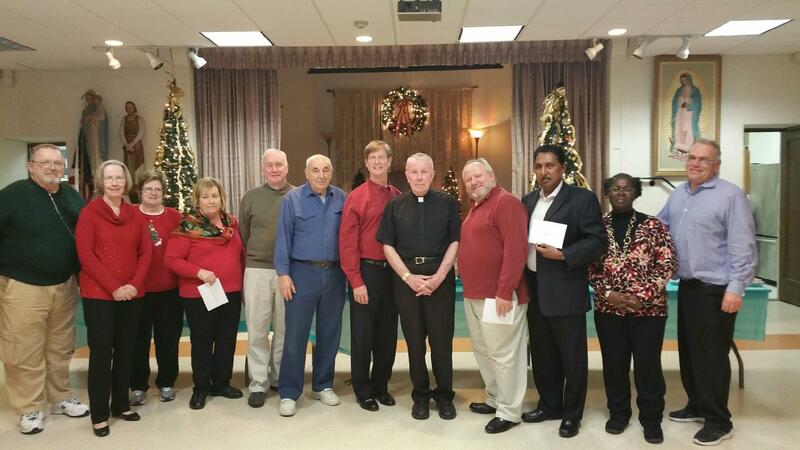 The gifts were presented at the councils’ annual Christmas parties, which were both held the same night, December 15. Other recipients at the Triune Council party were: The Rockland County Catholic Coalition, St. Margaret’s, St. Aedan’s, and St. Anthony’s churches, Birthright, COPS Barn (provides therapeutic horseback riding for special needs children), Good Counsel Homes, Fisher House Foundation (provides nearby free or low-cost housing for families of military personnel receiving hospital treatment), the Little Servants of Divine Providence (serves the disabled, homeless, and needy in Kerala, India), The Rockland Sister Cities Project (helps the impoverished children in Nicaragua), and the Salesian Missions. 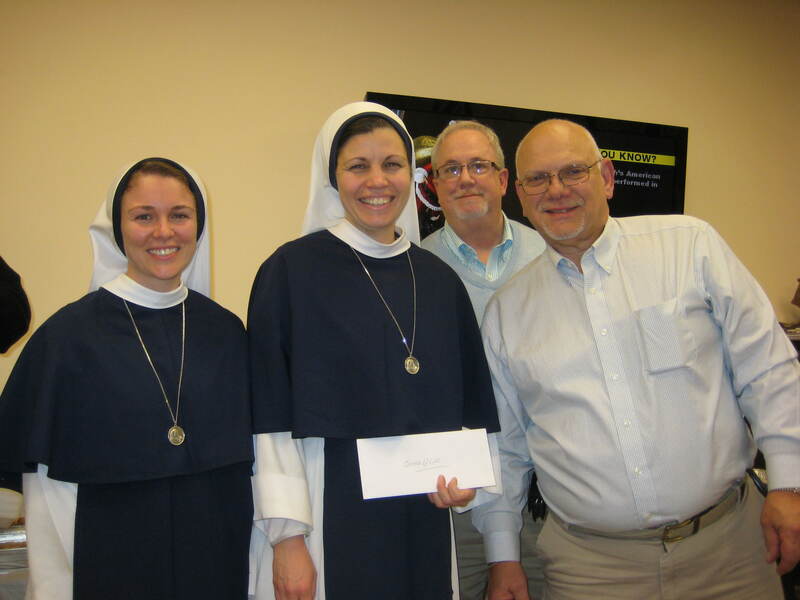 Grand Knight Stephen Duschaneck and PGK Arthur Saladino present a Christmas donation to the Sisters of LIfe on behalf of the Knights of Columbus McCloskey Council. Photo courtesy of McCloskey Council 4565. At the McCloskey Council party, gifts were given to the Sisters of Life, Birthright, Good Counsel Homes, Jawonio (provides assistance to people of all ages with developmental disabilites, mental illness, and chronic medical conditions), and Camp Venture (provides services to children and adults with developmental disabilities), and St. Francis Church. Two seminarians at Dunwoodie — Tom Colucci, a parishioner at St. Francis, and Christian Amah– were also presented with donations to support their studies by Grand Knight Steve Duschaneck. This entry was posted in Culture of Life by rocklandrtl. Bookmark the permalink.